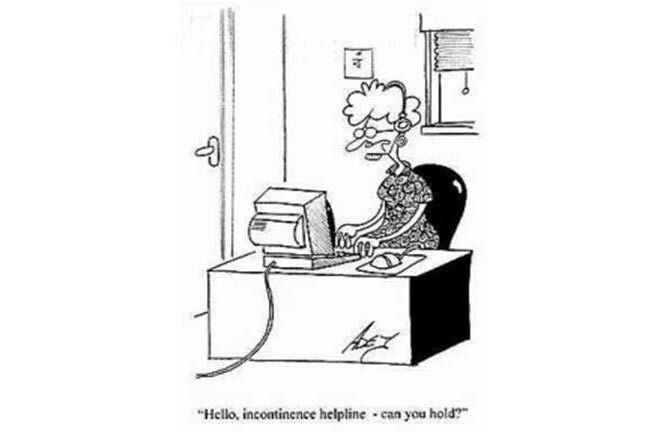 Incontinence Hotline—Can you hold please? Turns out, this joke isn’t a joke. I googled “Incontinence helpline” and found WebMD reporting that YES this exists. You know me, I called them…. and got a recording!! It also appeared that this phone number had nothing to do with incontinence, so they must get very interesting voicemail messages. 10 More Incontinence Cartoons – They are only funny if it isn’t about you. Afraid to cough, sneeze or lift heavy things? Could magnesium help? Read on! I’m wondering what kind of help we get from the medical community? What are the medical options listed? Doctors prescribe drugs like Toviaz, Ditropan, Vesicare, Detrol and Sanctura. These drugs block a God-given messenger called acetylcholine, relaxing the muscles of the bladder. I’m not here to tell you not to take your medication, but you owe it to yourself to find out what the side effects are that you might experience. As I said, these drugs interfere with your body’s Acetylcholine. There are drugs used to treat Alzheimer’s disease that work by raising acetylcholine in brain cells, the opposite action of the drugs used to treat incontinence, which work to lower acetylcholine. Acetylcholine has many jobs, we can’t just whack it before we try other things first. People with memory loss are given drugs to boost acetylcholine levels. People with incontinence are given drugs to suppress acetylcholine levels. “If you have both conditions, the situation is not good,” says David A. Lipschitz, MD, Ph.D, one of the most renowned geriatricians in the world. Every drug has side effects. Consider what might happen to your memory if you take an incontinence drug. Let’s list some basic things that can help. This exercise uses the pelvic muscles, the ones that we use to stop the flow of urine. This exercise is done when you are NOT urinating. Hold and release this muscle 10 times, a 10 times a day. When able, do 10 repetitions, 10 times a day. You may need to work up to this. After menopause some of our muscles and tissues thin and weaken. Add Progessence progesterone essential oil (use as little as 2 drops a day and it will last 4 months, enough to see if you like it). Progessence is intended only for women. It is a good option for those looking to supplement progesterone levels. Expertly formulated by D. Gary Young and Dan Purser, MD, Progessence Plus takes pure, USP-grade, super-micronized progesterone from wild yams and combines it with vitamin E and an essential oil serum to easily penetrate the skin for improved delivery. This product does not require the cycling of application sites as do most other progesterone products. After age 35 men and women make less and less DHEA. DHEA is the mother of all steroid hormones, and is a building block for 50 other hormones including estrogen and testosterone. DHEA is converted to whatever hormone your body is lacking (except progesterone is not made from DHEA). After age 35 men and women make less and less DHEA. High levels of stress also can result in low DHEA. DHEA is often called “The Fountain of Youth” because it stimulates Human Growth Hormone and improves energy, libido, skin tone/moisture, bone health, brain health, immune system, fat-burning and much more! High levels of stress also can result in low DHEA. Eat more fresh vegetables and some fruit. Eat more dark green leafy veggies every day, saute in butter (collards, spinach, chard, turnip greens) or add to a protein/fat smoothie. Add 1/4 tsp aluminum-free baking soda to a glass of water in the late afternoon. Take 3 capsules in the a.m. and 3 capsules at bedtime. Free of corn, dairy, egg, wheat, gluten, sugar, yeast, artificial colors/flavors. Vegetarian product. Kosher product. Black Cohosh Root, Ginger Root, Gravel Root, Juniper Berries, Lobelia Herb, Marshmallow Root, Parsley Root, Uva Ursi Leaf & White Pond Lily. 7. Evening Primrose Oil – EPO has a high concentration of gamma-linoleic acid (GLA), a fatty acid. EPO is beneficial for bladder cell structure and also benefits the skin, improving elasticity.